Roasted chicken is a delicious part of the Sunday lunch menu in many homes. Especially in colder months, it becomes a comfort food that we might often crave. Here are 5 tips that will ensure juicy meat and extend the use of the roasted chicken well beyond the first day. Chicken is best roasted at 180C (350F) in a non-fan-forced oven. This is because the fan-forced air can dry the chicken out. For juiciest chicken and crispy skin, place the chicken in a roasting tray set on the rack in the lower-middle of the oven where there will be room for the chicken and the air won’t be as hot, resulting in gentler cooking. Fill the cavity with lemon cut into wedges, whole garlic cloves and fresh herbs such as bruised lemongrass stalks, rosemary, bay leaf or thyme. Rub the skin with a spice mix of your choice – Texan barbecue, mexican, lemon pepper or paprika work well. This trick to a crispy skin and succulent breast meat is one I learnt from my Mum. The secret lies in separating the skin from the breasts by sliding your hand in between the two and placing about 2 tablespoons of softened butter between the skin and the breast meat. 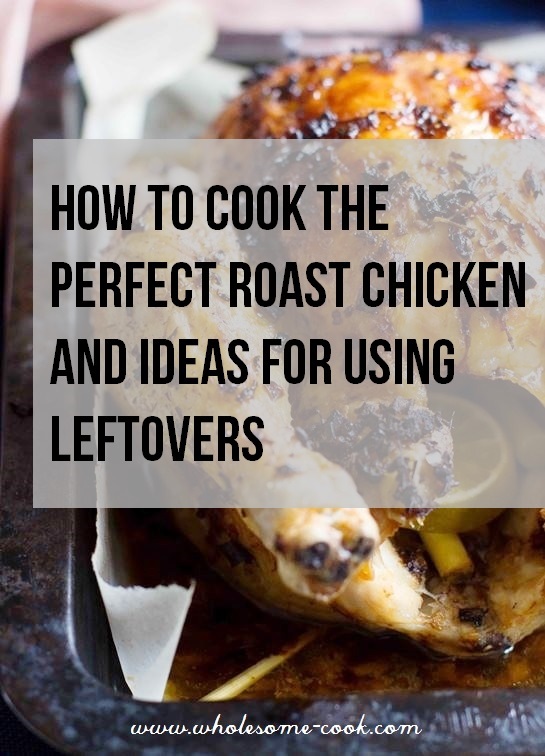 Roast as per usual but every 20 minutes or so, remove the chicken from the oven – shutting the door to stop the heat from escaping, and baste the skin with the melted butter and fat that’s gathered at the bottom of the tray. Do the last basting 20 minutes before removing the chicken from the oven in order for the skin to crisp up. 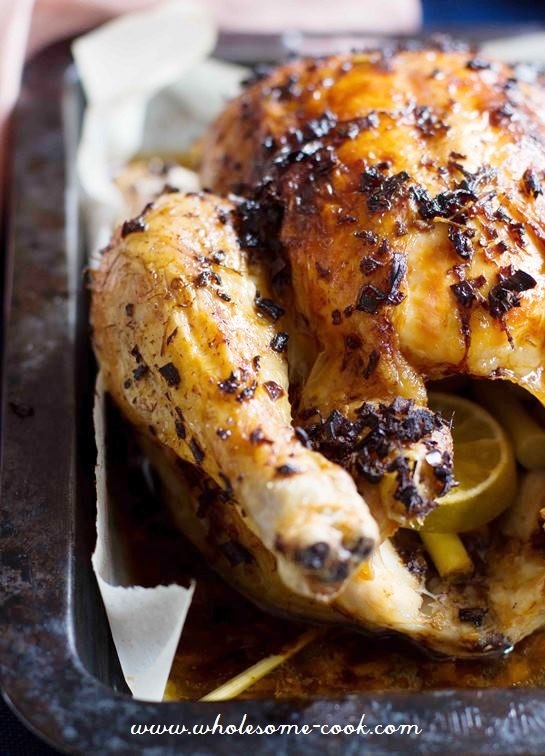 When it comes to roasting whole chicken, allow 25 minutes cooking time per 500g of chicken (i.e. a 1.5 kilo chicken would roast for 1.5 hours). As with all roasts, it is best to check doneness using a an electronic meat thermometer and piercing the probe into the thickest part of the breast and the leg. It should be between 72C and 75C (160F and 170F). Note that if using a breadcrumb or other heavy stuffing, the stuffing that needs to reach that temperature as well so point the probe accordingly. Other tell-tale signs that your chicken is ready are legs and wings wiggling freely, almost falling off and the juices running clear. Freeze leftover roast shredded or sliced chicken meat in small portions to minimise waste and maximise usage opportunities. Defrost in the fridge overnight. Related: 7+ recipe ideas for using store-bought roast chickens, which also apply to home roasted birds. Steam it from cold – this one’s my favourite! This is a great tip and a one pot wonder meal in its own. Simply place slices of cold roasted chicken leftovers on a piece of baking paper and add to the steaming basket for 2 minutes. You can steam vegetables first, placing the chicken on top of the vegetables when they are about done. Serve juicy warm chicken with a salsa verde or chimichurri. Use up leftover bones and fatty skin pieces to add flavour to homemade stock. Serve leftover roast chicken in this Kale and Quinoa Salad, a Retro Sandwich or a Vietnamese Bahn Mi. Matzo Ball and Chicken Soup provides both comfort and that traditional healing of a good chicken soup. and Chicken Try adding chicken to an Italian Straciatella Soup – don’t worry, it’s not made from vanilla ice cream and chocolate, that would be weird. Chicken and goat’s cheese dumplings are absolutely delicious and a fun weekend activity for the whole family. Chicken and vegetable pies used to be my favourite and I am happy to report that leftover roast chicken makes for a beautiful stuffing. Frozen veggies make it a quick mid-week dinner as well. Christmas cookie madness: gingerbread spice mix, gingerbread cookie dough and… gingerbread ice cream!